This is a three day-course concentrating on mental and physical survival. Mornings will consist of classroom lecture and discussion. Afternoons will consist of demonstrations and hands-on in the gym. Cost: $300 per student (minimum of 20 students max of 30) plus travel and lodging. Instructors: Sgt. Jim Detrick and Sgt Don Gulla are both members of the King County’s Critical Incident Debriefing Team and Arrestling Instructors or Certified students. 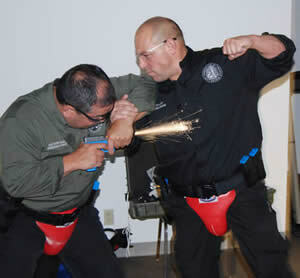 Don is a Master Defensive Tactics Instructor, Senior Master Taser Instructor and Master Firearms Instructor. Certificate: Students will receive certificate/credit for Course #0453: Officer Safety Surviving Critical Incidents from the Washington State Criminal Justice Training Center. The hands-on portion will include but not be limited to: Head Shot Avoidance, Ambush Survival, Weapon Retention, Physical Control Techniques, Ground Fighting Survival Tactics and Realistic Shooting Scenarios. 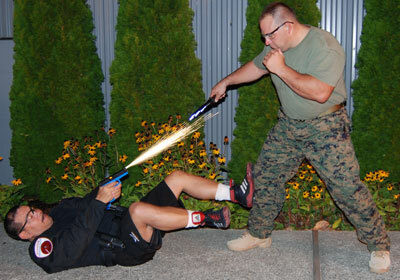 New Day Three Course will cover Surviving Violent Encounter around Motor Vehicles. Including dangers of the high risk vehicle stop, suspect trying to run you down, ambush inside patrol vehicle, shooting at stationary/moving vehicles and surviving traffic stops. Airsoft if it fits your holster; Simmunition Conversion Kit if you carry something other than Glock. Glock T-17s will be available. MMA Gloves – Neck Protector – Mat shoes if you have them. Knee pads. BDU Pants and Jacket.